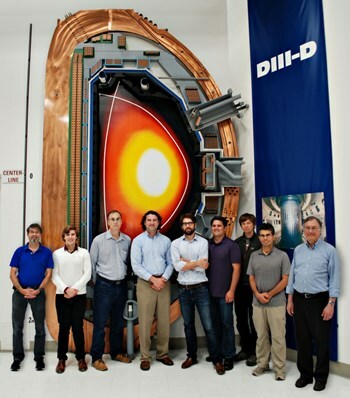 Small irregularities, or "error fields," in the magnetic field of tokamaks may lead to effects that include degradation of plasma confinement and generation of plasma instabilities. In tokamaks such as ITER, these irregularities are "smoothed" using special control coils. In the ITER design, 18 superconducting correction coils inserted between the toroidal and poloidal field coils will compensate for field errors caused by geometrical deviations due to manufacturing and assembly tolerances. However efficient methods to detect the error fields and to determine the optimum currents in the correction coils have been a challenge in present devices. Scientists at the DIII-D National Fusion Facility—the largest magnetic fusion facility in the United States—have developed a new method for minimizing magnetic field asymmetries in a tokamak. The method is based on maximizing rotation of the confined plasma during a single discharge and has been successfully tested in preliminary experiments at DIII-D. The research team consisted of scientists from multiple institutions, including General Atomics, Oak Ridge Associated Universities, University of California-San Diego, and Columbia University. Rather than apply an approximate, pre-calculated correction, the new method continuously adjusts the currents in the correction coils. One effect of an error field is a braking force that reduces the plasma's rotation, so the control system measures the plasma rotation in real-time while continuously varying the correction field. Using modern control science methods, this process rapidly determines the optimal correction field that minimizes the braking. Real-time maximization of the plasma rotation has several advantages: efficient optimization of the correction field within a single discharge (simulations suggest that the optimization process can be performed in ITER in a few tens of seconds); minimization of the risk to inadvertently destabilize the plasma; and continuous tracking of variations in error field sources to maintain the best plasma conditions throughout the discharge. These advantages make this new method a promising option for improving the operation of ITER by minimizing the undesirable effects of error fields. For further details, please see the full article in Nuclear Fusion here.